I have always wanted to conquer the roasting of a whole chicken and I finally did it! Guess what?? It’s actually quite easy and it looks, smells, and tastes phenomenal. Best of all, a 6 pound chicken fed my whole crew for Sunday dinner and made a great lunch for my kiddos throughout the week. I also threw together a quick chicken salad for myself with some of the leftovers. This recipe is one that can become a classic go-to impressive meal for you to wow your family and friends. 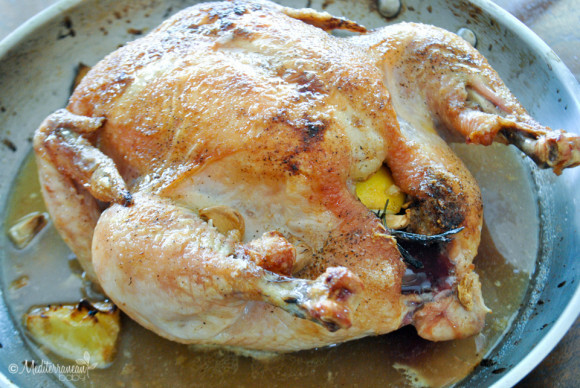 Rinse the chicken, removing and discarding anything in the breast cavity such as the neck and/or giblets. Thoroughly pat the chicken dry with paper towels. Place in a large skillet or frying pan, preferably stainless steel. Rub the entire exterior of the chicken with butter. Sprinkle liberally with salt and pepper. Squeeze 1/2 of the lemon over the chicken exterior. Fill the chest cavity with the other half of the lemon, the sprig of rosemary, and half of the garlic cloves. 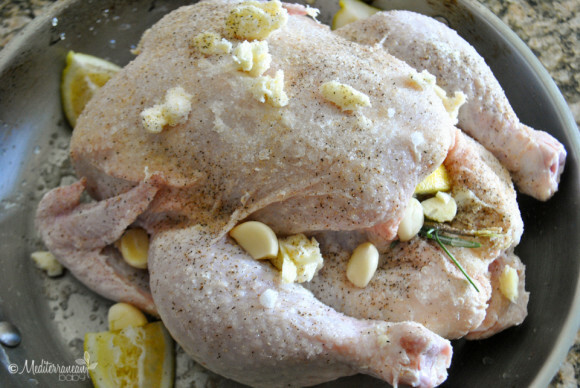 Place the remaining garlic cloves on the exterior of the chicken, in the nook of the wings, etc. Brown in the oven, uncovered, at 425 for 20 minutes. Reduce the heat to 375 and continue to roast uncovered for 1 hour. Remove from the oven and pour the white wine over the chicken. Place back in the oven, uncovered, for 30 minutes until the juices run clear and the chicken is thoroughly cooked through. 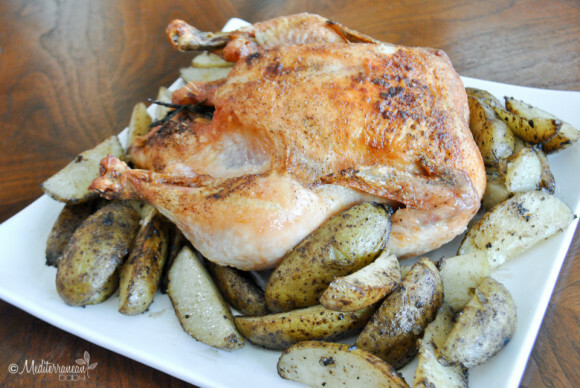 I serve the chicken on a platter with roasted skillet potatoes. There is nothing better than the smell of a chicken roasting away! This one looks fantastic! Thank you so much for linking up with us at #FoodieFridays! Love your fabulous recipe. Stopping by from Moonlight and Mason jars to pin. I would be honored if you would consider sharing your delicious post on Foodie Fridays where I am co-hosting. The party starts Thursday 9 pm Est. Hope to see you there. Thank you, Shari. I would love to join. See you there! Have a great week! Visit Mediterranean Baby's profile on Pinterest.